This is my sixth year keeping a December Daily. I have written posts about some of my previous December Dailies in the past but this is a new Christmas to document and I’m as excited as ever. Here are just a few quick pictures of my set-up. I usually use old book covers for my December Dailies. The cute snowman image is a piece of a Christmas napkin I decoupaged to the front cover. If you want to decoupage a light-colored napkin, tissue paper or thin paper on a dark background you may want to paint a layer of white underneath. If I hadn’t painted white underneath this napkin I would have ended up with a light green snowman. I just painted a section white and dabbed the edges to soften them and somehow it just looks like snow around the snowman. Of course I added chunky glitter to make my snowman glittery! 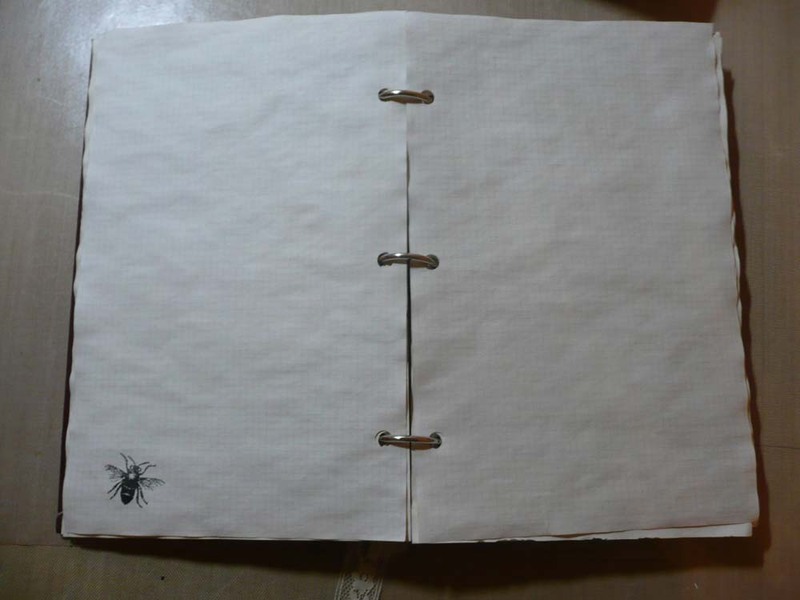 I selected about forty assorted pieces of paper for the pages. 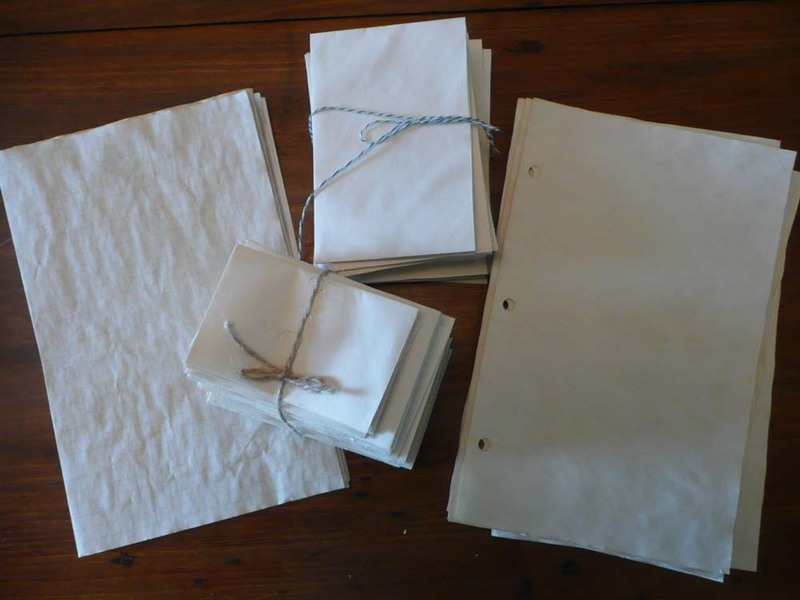 Not all are scrapbook paper however, some are vintage Christmas cards, envelopes, Christmas book pages, Christmas carol pages, old advertisements, etc.. I like to document my entire December and not just through Christmas day. I’ve made sure I have enough “pages” to have at least one a day. Sometimes I may use two pages for one day if a lot was going on and some days I may only use one side of a page. If I don’t have enough pages I can always add more and if I have too many I can take some out. After I’ve picked the papers I want to use, I spread them all out on the dining room table and then put them together in an order that is pleasing to me. When arranging the pages I consider color, size and type (such as book page or Christmas card) so I don’t have two of the same type near each other. I make sure my nativity pages are approximately around the 24th of December. I can always fine tune the location of pages as I go along. I like to attach a small decorative paper bag to the inside of the back cover. That gives me a place to stash embellishments I want to use in the journal. When my journal is completed the bag gives me a place to put items I want to keep that didn’t make it onto a page. I use O rings to keep my journal together. They allow me to make my journals good and chunky and give me the freedom to add or take out pages as needed. Sometimes I will remove a page to work on it if I’m going to use wet mediums like paint or spray ink. Most people who are in the arts and crafts or planner worlds know what a traveler’s notebook is. There are tons of videos and blog posts about how to set up your TN (traveler’s notebook). And what you use them for is only limited by your imagination. I have watched many YouTube videos showing pretty TNs filled with TN inserts and paraphernalia all which add up to the cost of a new car! I’m not kidding, the bare bones TNs, without inserts, sell from $30.00-$70.00. Yeah, I’m so not cool with that. So I decided to make my own TN. Basically all they are is a piece of leather or vinyl and some elastic cord. So how hard could it be to make my own? Not hard at all. I used two pieces of sample vinyl wallpapers from one of those huge sample books. First I glued them backsides together so I have a pretty cover and inside. Then I followed a video detailing how to attach the elastic pieces. This is what my bare bones TN looks like. Okay, I know it doesn’t look great yet, but that is because I haven’t worked on any of the pages inside. Here are some of the pages I’ve made for my journal. As my prayers are private, I photographed these pages before I wrote my prayers on them. Traveler’s notebooks, however you deem to use them, are a great way to use your creativity as well as use your stash! If you don’t already have a TN, check out some videos about them. I bet you’ll get hooked just like I did! As mentioned in my last post, I am trying to use up my paper scraps from crafting instead of letting them go to waste. 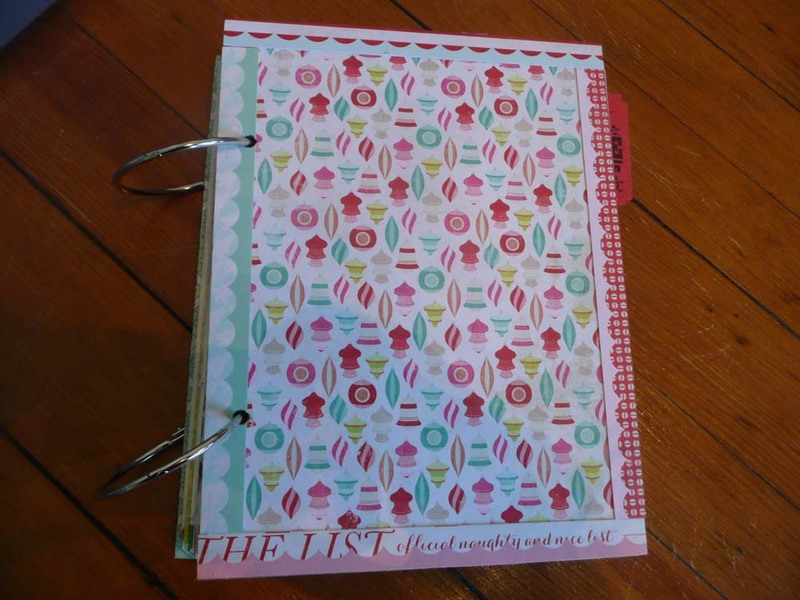 I promised two more projects that will help you bust your scrap box, basket or suitcase! The first project I’m going to share is Christmas embellishments. First, I cut some scraps into interesting shapes, both by hand and with dies. Then I made some ornament shapes just using a round die and gluing a topper on each. Next I just played and played with all my little goodies and came up with these cute embellishments. Please note that you are not going to get rid of lots of scrap paper, as these embellies are so small, but you will use up the smaller pieces. The bonus is that you will have a stash of Christmas embellishments for cards, tags and other projects for 2017 already done! This was a super fun and relaxing project. After Christmas I plan on making loads more and for once, getting ahead of the Christmas rush! If you have followed my last couple of posts you will know that I am making lots of journals for the shows I am doing later this year. 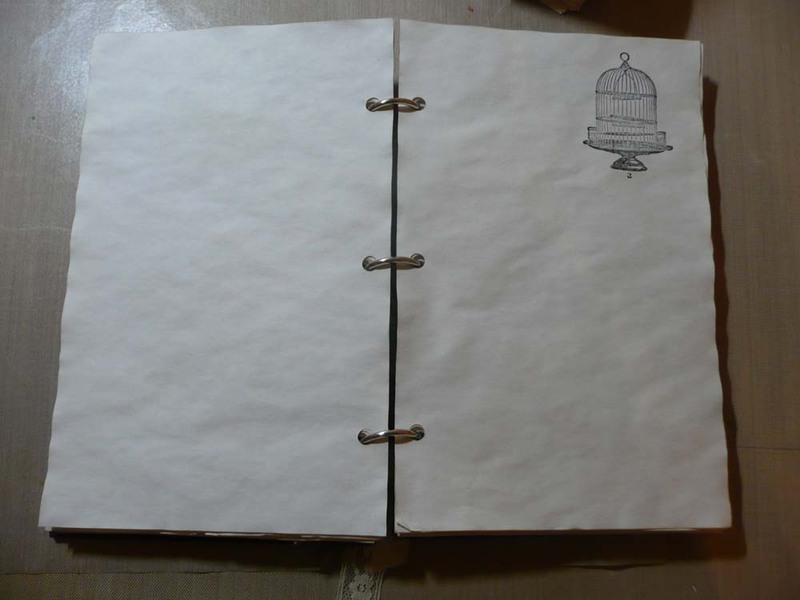 I had made a stack of hand-bound journals using coffee stained papers. It just so happened that I had a stack of the papers left over that were not the right size for the bound journals. See the stack with the holes in it? Stack of coffee stained papers. What to do? What to do? Well it so happened that the holes all lined up perfectly so really all I needed was to find a cover that fit and some book rings. I found an old book called, “Asylum For The Queen”. I never read it but I loved the title. Here is the finished journal. I had to add pretty ribbons and charms, including a crown as the title dictated. Bees remind me of Marie Antoinette. On some of the pages I stamped images that remind me of old royalty. This journal has blank pages, except for the few stamps, to allow for lots of journaling or space for smashing other ephemera. I’m so happy I was able to use every last piece of the papers I had stained from that project! With Kindles, computers, tablets, IPhones, etc., good old paper books are getting the big heave-ho in many homes. 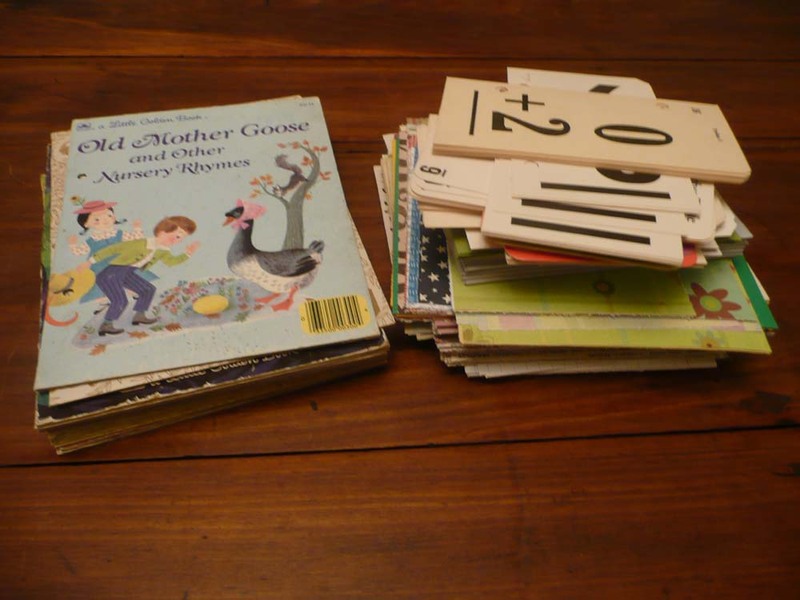 Thrift shops are becoming so flooded with books that many are starting to give them away for free while others charge only 25-50 cents a piece. I for one still love to read actual paper books and it breaks my heart to see them devalued in society today. As many of you know, I am an avid thrift shop junkie and yes, I always look at the books. And even though I am not interested in reading most of what I find, there are other criteria that will get them into my shopping basket. Do they have nice and interesting hard covers? Do they have fun vintage graphics? 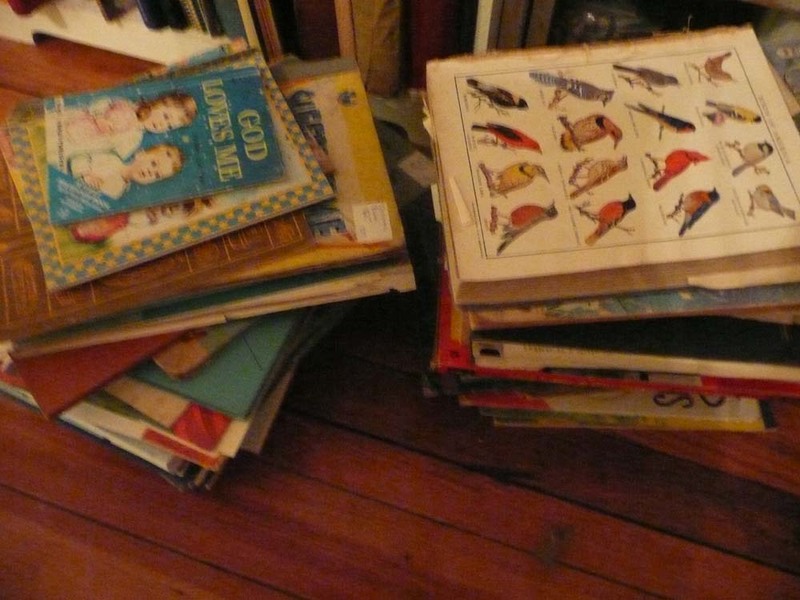 Are they vintage children’s books, especially Little Golden Books? Are they old accounting ledgers or logs of some sort? Here are some (and I emphasize some) of the books I have purchased recently. Notice they don’t fit on the bookshelf so they are piled up on the floor! A shameful hoard of old books. So what do I do with all these old books? First of all, I deconstruct them and separate the pages from the covers. Then I pull out all kinds of other vintage ephemera I have such as flash cards, stationary, envelopes, playing cards, graph paper, scrapbook papers and the list goes on. Deconstructed book covers with a stack of mixed ephemera. Next I sort the papers and ephemera into equal piles according to the number of book covers I have. 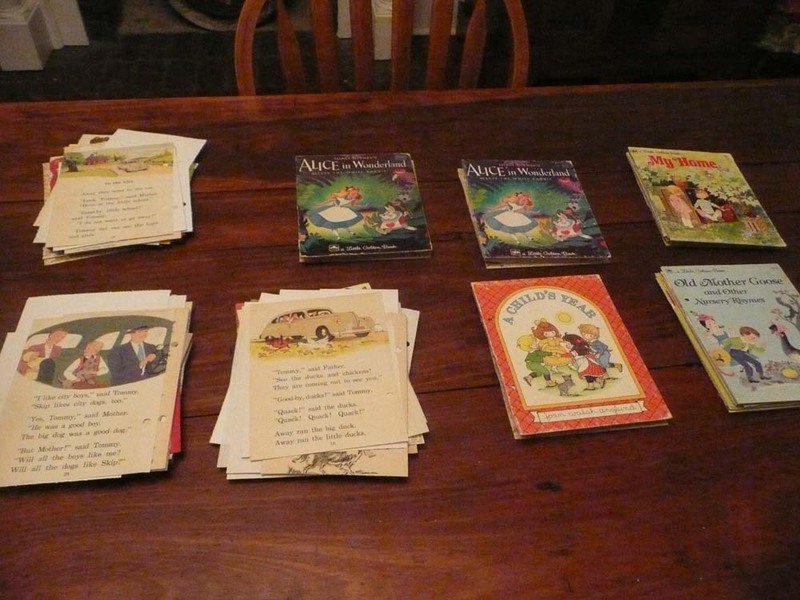 Sorting paper and ephemera into piles, each with a book cover. Lastly I bind the books together to make sweet vintage junk journals. Usually I bind them with binder rings so there is lots of room for the new owner to add their own treasures. 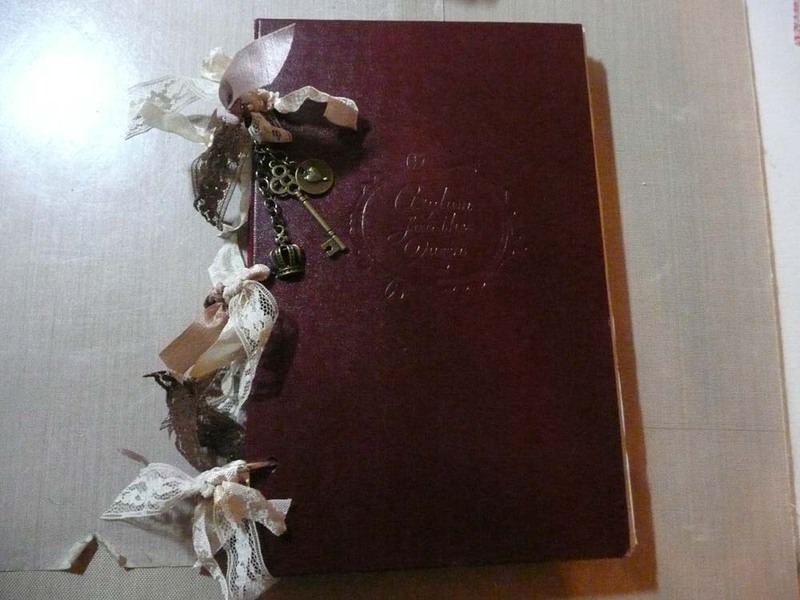 I tie some ribbon on the book rings and each is given a charm to dangle from the top ring. 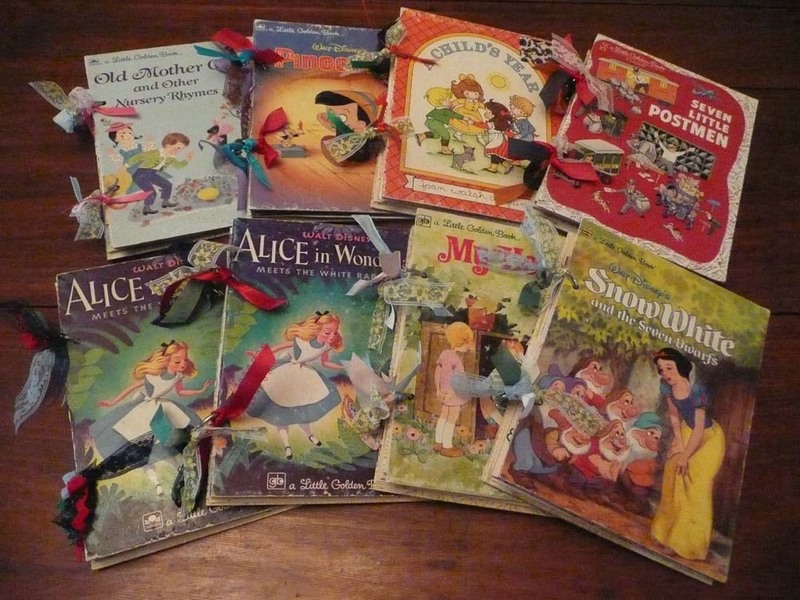 Eight finished junk journals made from old Golden Book covers. These junk journals function just as the others I have made. You can glue, staple, tape and clip your ticket stubs, cute packaging tags, greeting cards and all sorts of other collected ephemera onto the pages. This is a really fun way to keep and display all those little bits of paper and ephemera that you have collected and don’t know what to do with. These journals will be packed up for some shows Mossy Cottage will be selling at this coming fall. I have many more books to give a new life to and plan of rescuing as many as I can in the months to come! Happy New Year everyone! I know it has been a long time since I last wrote a post but you know how busy the holidays are. I am betting that all of you were too busy to read blog posts anyway, right? Well, now that the holidays are over for the most part I will show you something that I made to help me remember this wonderful Christmas time. If you have read my blog for a couple of months or more you will remember seeing my December Daily in the post, “Out of the Mess”. This is the unfinished version. The pages were all there but none of them, including the cover had been decorated. Well everyday in December I wrote down a little something I did and put aside some ephemera that corresponded with what I wrote down. Then every other day or so, I played with my December Daily and all the embellishments and ephemera I had so I could go back to it in the years to come and remember the fun times. This is what my December Daily looks like now! I didn’t show you all the pages but you get the idea. This is the second year I have made a December Daily and I love them. I had so much fun reading what I did at Christmas time last year I know this is a tradition I will hold on to. So now you can see how my December Daily (and my waistline) went from flat to fat over the holidays. Later this year I will post a blog when I start constructing my one for Christmas 2015 and I hope some of you will come and play along! Several people who have seen the mini-album I made for the swap with my friend Camilla said they would like to see the one she gave me too. I love the album so much that this is an easy post to do! If you read my last post about the album I made for her you will remember there were very few rules we went by. First the album had to be a Christmas themed album. It had to be a mini-album versus a regular sized album and it could only have 6 pages. Pretty simple right? Well, Camilla and I have very similar tastes when it comes to artsy things and we are constantly re-pinning each others pins on Pinterest so it is amazing how different our albums were. But at the same time, there were similarities too! So without any further to-do, here are pictures from the album I received. There is no way I can do this wonderful album justice with just my photos and words. I could not take pictures of all the pages or all the details as it would have taken forever! Every page is so special and there is no rhyme nor reason to the pages I picked to show you as I just picked them randomly. Camilla really out did herself with this album and I will cherish it forever. I made sure to take lots of pictures this Christmas season so I can fill it up. As I mentioned in my last post, Camilla and I are doing a junk journal swap next. This album has really set the bar high for me but I already have some great junk saved up! I am a lover of all things vintage, chippy and shabby and spend a good deal of my time "junking". I love mixed media, paper crafts and sewing. I am blessed to be the owner of Mossy Cottage, a shop that specializes vintage items, up-cycled jewelry and mixed media arts and crafts. I have a wonderful supportive husband and son who are willing to step in to help when I need things schlepped, loaded or rearranged. I try to use the talents God gave me to make a difference wherever I can.